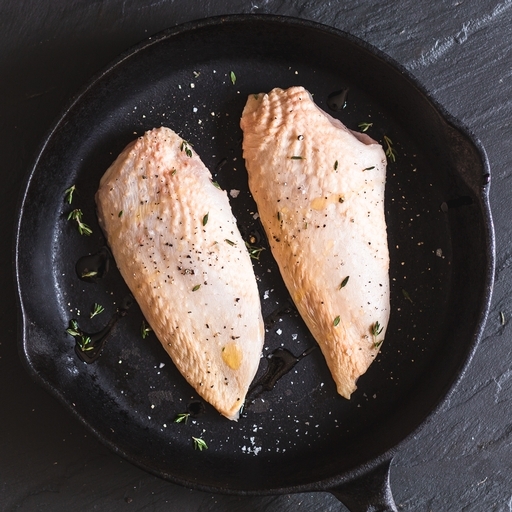 Fresh organic chicken breast fillets. We source our chicken from organic, truly free-range West Country farms. Short of raising chickens in the garden yourself, it would be hard to better these birds for flavour and welfare. The breast is lean, tender and endlessly versatile; we leave the skin on, as it helps the meat stay super succulent. You can roast, fry or gently poach the breast whole; about 15 mins in a moderate oven, frying pan or barely simmering pan (make sure no pink remains). If frying or roasting, try and get the skin nicely browned. Cut the breasts into thin strips or cubes for a faster cook in a frying pan - 4-5 mins should suffice.